The Sailor Pen Company was started in Hiroshima, Japan, after a British sailor demonstrated a fountain pen to Mr Kyugoro Sakata in 1911. After this first encounter with a fountain pen Mr Sakata, an engineer, decided he would produce his own fountain pens and Sailor the company was born. Nearly 100 years after its foundation The Sailor Pen Company still has a mission to create the finest, most elegant and highest specified fountain pens in the world. All Sailor pens are still produced in Hiroshima today, with a determination to maintain the heritage of high quality and unique writing instruments. All Sailor pens carry a guarantee - as you would expect from a company with products renowned for their quality and performance. Many pen enthusiasts suggest Sailor produces some of the finest nibs available today. 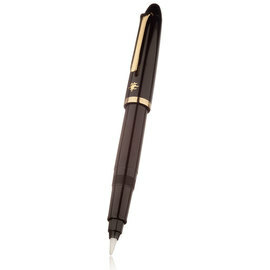 If you cannot find what you are looking for please contact us, as we are able to supply you with any item you desire from the beautiful Sailor pen collection. We can normally supply any Sailor pen currently available in the UK within two working days. This unusual pen from Sailor allows stroke widths from fine to broad to be produced by altering the angle. 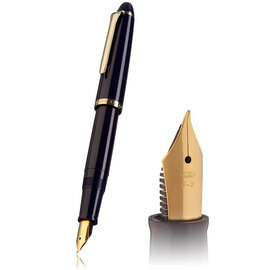 The 1911 Fude-de-Mannen comes with a gold plated stainless steel nib in the 1911 design. Elegant and traditional in style the Sailor 1911 Large fountain pen has a high quality 21-carat gold nib. This Sailor 1911 is fitted with the exceptionally unique Naginata Cross-point nib; two nibs crafted on top of one another before being slit into a cross to allow for extremely expressive writing strokes. Line width is extremely responsive to the angle of the pen, giving the feel of writing with a Japanese brush pen. Hand-made in Japan by Sailor's master craftsmen. The Sailor 1911 Large, here with the Cross Emperor 21K gold nib. 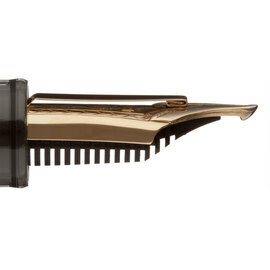 The Emperor 'bar' provides an extra reservoir allowing this amazing nib to produce a wide variety of strokes and to maintain a constant ink flow, even with vigorous use. Hand-made in Japan by Sailor's master craftsmen. 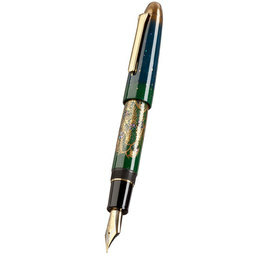 The popular 1911 Large fountain pen, offered here with a range of Naginata-togi 21K gold nibs. The Sailor 1911 Brush pen is a true brush pen and is refillable using Sailor Brush Pen Cartridges. It will also accept the standard Sailor converter. Replacement brush tips are available. 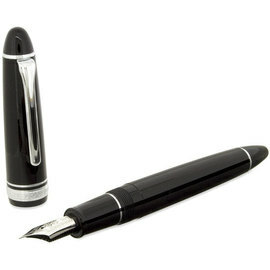 The ultra-slim and very elegant Chalana fountain pen from Sailor is ideal for fitting into a diary or organiser. Available in Stripe or Barley designs in both gold and silver finish with black trim. 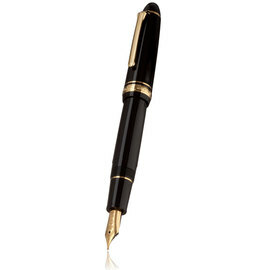 Hand-crafted from ebonite, this oversize pen is Sailor's flagship design. 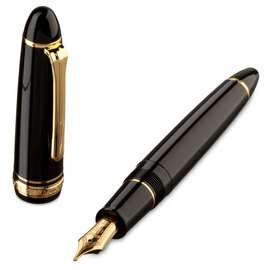 Natural ebonite is a traditional material for pen manufacture and imparts a particular quality and character to this magnificent writing instrument. The grandeur of the Sailor Ebonite King of Pens is here combined with the exclusive range of Nagahara hand-crafted nibs to give the best possible writing experience. Produced as a limited edition of 33 the Kai King of Pens has been decorated by maki-e artist Wataru Kurotobi. 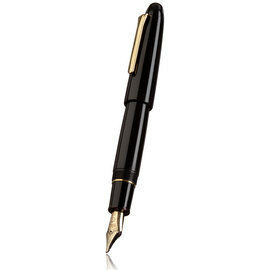 This oversize ebonite pen comes with a rhodium plated 21K gold nib. The Sailor King Professional Gear Naginata-Togi is an oversized Pro Gear fitted with a very special 21-carat handcrafted cross-point nib made by master nib maker Nobuyoshi Nagahara. 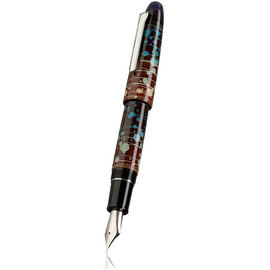 The Kurenai is a maki-e decorated ebonite King of Pens. The Sailor Kurenai (deep crimson red colour) has been produced by urushi artist Wataru Kurotobi and is limited to an edition of 33 numbered pens. The Professional Gear King of Pens is the largest of the Sailor Professional Gear series. 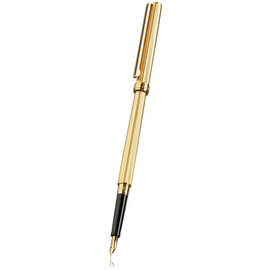 This oversize pen is available in black with either rhodium or gold trim. Sailor's Professional Gear fitted with a very special 21-carat handcrafted cross-point nib made by master nib maker Nobuyoshi Nagahara. 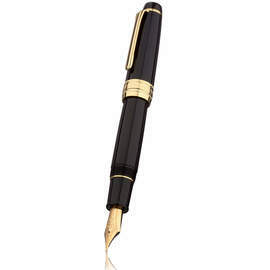 Sailor's Professional Gear featuring the Cross Emperor 21K gold nib - a handcrafted cross-point nib with an Emperor 'bar' to provide an extra reservoir allowing a constant ink flow across a wide variety of strokes. The Progear II Realo combines the features of the Progear II series with a piston filling system for those who value the extra ink capacity. Made from black PMMA resin, the Progear II Realo comes with 24K gold plated trim and a bicolour 21K gold nib with selective rhodium plating. 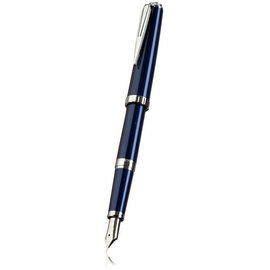 A sleek modern pen, the Sailor Reglus series is available in a range of six subtle colours. Four maki-e designs from artist Ikki Moroike each depicting one of the seasons decorate the Sailor King of pens in this sumptuous limited edition series. 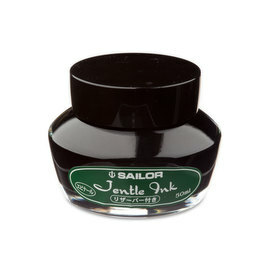 Sailor's range of bottled Jentle inks including 'The Seasons', as well as cartridges, and Kiwaguro and Seiboku Ink.